A symphony of computer mouse clicks and punches from keyboard keys fills the room of Pryzbyla 224. A low, whirring hum from the desktops underscores it all as if the machines are operating at hyper speed. The operators are moving just as fast, their eyes darting rapidly across their screens from pixel-to-pixel as their fingers drum feverishly away. Their concentration is held, except for the occasional directive or slant barked by one teammate to another. “No, totally tilted!” Hinson replies. Observing from a chair behind them sits Coach Joe Bieda, taking notes on a pad and offering a sage word or two. Standing next to him is Catholic University’s Esports president Byron Hinson, a senior mechanical engineering major from Ashburn, VA. With Bieda at the helm, Hinson on his right, and the platoon putting all it has into its match, the team looked similar to Captain Kirk’s USS Enterprise from Star Trek. It may just be fighting a virtual team of enemies in an online game of League of Legends, but for Hinson and his team, it is all very real. A lot is at stake for CUA Esports. They hope to compete with nearly 90 other university teams in the Eastern Esports Conference of the American Esports Collegiate League after a series of qualifiers. Over the past five years, Esports has become a major inroad for university students. New programs have popped up all over the country, and scholarships worth thousands of dollars are offered to students able and willing to play and compete competitively. Esports is a lucrative venture for both the students involved and the universities organizing them. At the start of this year, the Cardinals threw their hat into the virtual ring. Hinson said the idea for Esports came from the Fitness Center after a surge of student interest. After going back and forth over email about what equipment they ought to use and how to organize the team, he was invited to join the e-board as President. After getting approval from OCA to be added to The Nest and tabling at events like Fall Festival and Odyssey Day, membership grew substantially. And since August, Hinson has been building up his team and spreading the word on campus. And while there is currently no scholarship program at Catholic for Esports involvement, it has not stifled the excitement for those involved. Esports has helped make the transition to the university more enjoyable for some of its members. Luke Kelty, a freshman computer science major from North Carolina, is one such case. Kelty had previously hoped to attend NC State and join their Esports team. When he came to Catholic, he was pleased to see the inclusion of a new team and saw it as an even better opportunity for him. “I would have never been able to play on NC’s team. I would’ve been on a back-up group and worked up, like JV. But here I can actually have an opportunity to take something I’ve been playing for years and use it to get the school a trophy or some recognition. That’s really gratifying,” he said. Esports has offered a similar experience for upperclassmen as well. Austin Chiles, a senior computer science major from Rockville, MD, said the chance to play with a team has provided a new and engaging experience for him. “I’m fairly good because I know how the game works. Individually you’re trying to do everything you can on your own. But with a team I can talk to someone and bring them with me. It’s very interesting. The amount I can do in a team environment is double what I could ever accomplish on my own,” Chiles said. Hinson said that he and Coach Bieda plan to open up the Esports room to all students once the space has been fully furnished. They hope to add game consoles like Xbox and PlayStation with some couches in addition to the rows of Alienware desktops. The idea will be that students could come in at any time and play games. Hinson said that providing an atmosphere like that on campus, a “safe space” for people to chill and have fun in, is a goal of his. There was even mention of a Super Smash Bros. Ultimate release day party supposedly in the works for December. 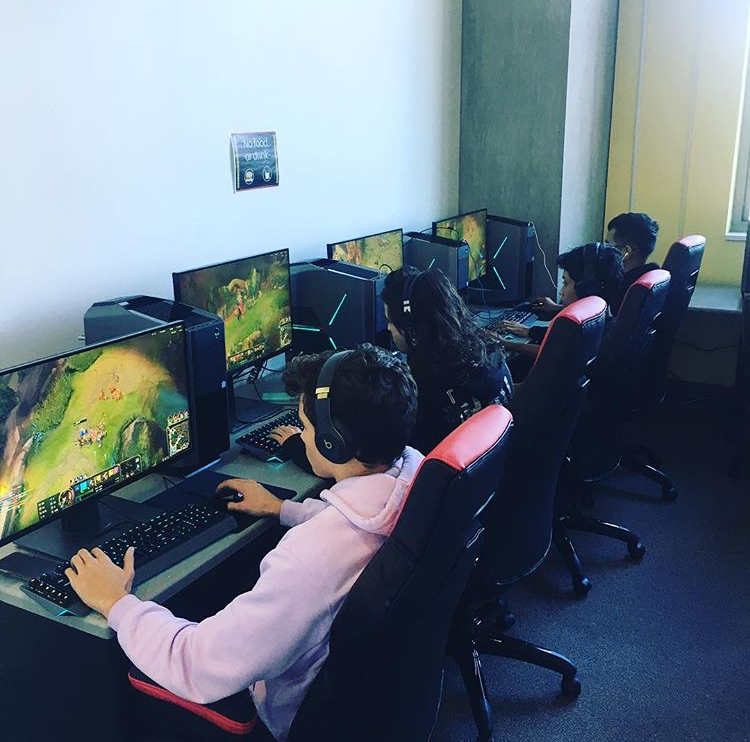 Esports may be going for the gold in the competitive sphere but for everyone else on campus it really is all fun and games. And that is precisely what Hinson the rest of the team want. Those interested in CUA Esports can find the organization page on The Nest or email Byron Hinson for more information (05hinson@cua.edu).